The mission of The Critter Team is to provide professional wildlife removal and control services in the greater Humble Texas area. We specialize in the delivery of professional raccoon trapping, raccoon removal and raccoon control services. The Critter Team is a licensed and insured wildlife management company specializing in nuisance animal control, nuisance animal removal and the decontamination and repair of commercial, residential and industrial facilities and properties. We can meet all your wildlife removal and control needs anywhere in Harris County, Texas. 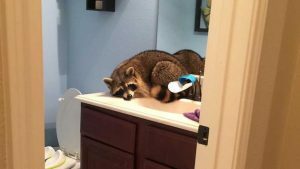 Humble TX has more than its share of mischievous raccoons. Although raccoons are relatively harmless when they reside in their natural habitat, raccoons become a nuisance when they migrate to an urban setting. Raccoons can damage your property, spread disease and endanger the safety of your family or employees. The Critter Team has the expertise to deliver effective raccoon trapping, raccoon removal, raccoon control and raccoon exclusion services in Humble TX. We regularly remove Humble raccoons from under porches, attics, crawl spaces, sheds and anywhere else that a raccoon shouldn’t be living. 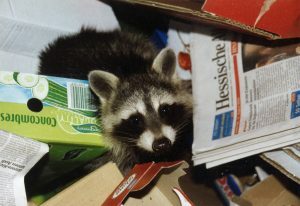 Raccoons have an uncanny ability to squeeze through small holes or structural defects in your building. Once a raccoon gets into your home or business, the animal will begin chewing on electrical wires and other building materials, contaminate insulation with feces and urine and accumulate nesting materials in your attic or some other cozy location. Needless to say, the combination of exposed electrical wires and nesting materials poses a significant fire hazard. The Critter Team will humanely trap and remove your uninvited houseguest, clean and decontaminate the area, repair all damage and permanently seal the openings that allowed the animal to gain entry to your premises in the first place. We don’t just get rid of the raccoon, we permanently prevent raccoons from entering your home or business again. It’s essential that your home or business be thoroughly cleaned to eliminate any trace of raccoon feces and urine. Contaminated insulation must also be removed and replaced. The Critter Team removes opossums, armadillos, beavers, rats, squirrels, skunks, birds, snakes and other pests from Humble TX residential, commercial and industrial facilities. A Raccoon is fairly large wild animals that usually live in dead trees, stumps and other natural cavities. The back of a raccoon has a grizzled appearance and is typically shaded dark to pale gray. The head, hips and feet of some raccoons are tinted red. The stomach and tail of the animal are colored white to pale gray. Male raccoons are a bit larger than female raccoons, but the coloring and markings are similar. Female raccoons give birth up to two litters of baby raccoons every year, so it’s a good idea to get those raccoons out of your attic before the damage and contamination start to multiply. The Critter Team can help. Raccoons are one of the most common nuisance wild animals in Harris County, Texas. Call The Critter Team the moment you hear scratching noises in the attic or notice a raccoon living anywhere on your property. Don’t allow raccoons to damage your property, including HVAC ducts, electrical wiring and building insulation, or endanger your health and safety. The Critter Team provides wildlife management and control services in Houston Metro Area.Call The Critter Team today at 281-667-0171 to have a raccoon or other pest removed from your home or business. We specialize in raccoon trapping, raccoon removal and raccoon control. The Critter Team is a veteran owned business in Humble TX that offers free estimates, affordable prices and unrivaled customer service.